In business since 1829, Confeitaria Nacional is my favourite pastry shop in Lisbon. This is my contribution to the City Daily Photo June Theme Day: "Zest"
A great photo of the pastry shop. A mirror on the ceiling adds a lot of zest for sure. Very excellent shot from one of my favorite places in Europe! The photo is fantastic JM, but I have to add :p for the pastries... ! It would also my favorite shop, and your photo is simply amazing! It looks like a great spot! This photo is so interesting. It took me a minute to realize that it is the ceiling. Very good choice for Theme Day! Terrific capture and what a great looking place! I love it and I also need to be there myself right now!! Great choice for Theme Day indeed!! I can make out some tasty treats in this shot! It's beautiful. What a cool shot. I can see why this is your favorite pastry shop. A fantastic reflection! Hope your day has been zesty! That's a beautiful ceiling. I can definitely see the appeal of the place. This is a very cool image, JM. Love it. Great reflection too. That's a beautifully made images. It reminds me some of the Cafe Zacher in Vienna and the Cafe Tortoni in Buenos Aires. 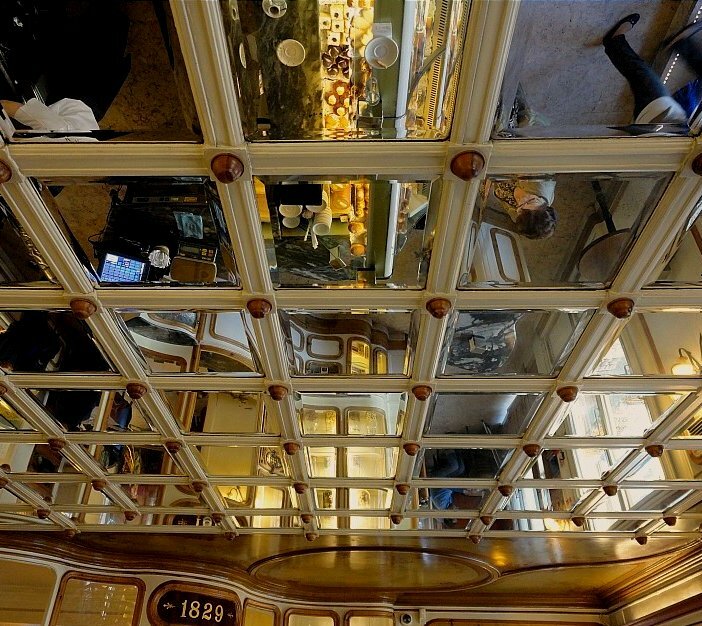 A great photo JM, I don't think I've ever seen a mirror ceiling in a pastry shop. Rich and lovely in every way. Oh this is just too clever Jose :) those are my kind of delicious reflections! Oh my! Looks wonderful. Super shot! Great reflections in that fabulous mirrored ceiling. Wonderful roof and super reflections.